It's more than a little confronting when a building that you recall being constructed turns up on the Heritage Register. I suppose that it's a result of Australia's relative youth that buildings younger than I am are recognised and protected in this way. I am reminded of the comment of a visiting Middle Eastern archeologist being shown the heritage listed City Hall. He asked when it was built. When told that it was erected in 1930 he remarked "My mother is older than that!" Everything is relative to your own perspective. I had similar feelings when I discovered that the Main Roads Department Building in Spring Hill had been added to the state's heritage pages. 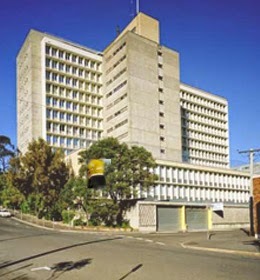 I remember the construction of the building in the sixties and its opening in 1967. In fact a classmate who was a whiz at technical drawing got a job there as a draftsman. Here is the earliest photograph of the building that I could find. Taken by well-known heritage photographer Richard Stringer in 1968, the image counterpoints the Modernist Main Roads building with the Spring Hill workers' cottages that surrounded it then. The building was designed by Dr Karl Langer, an Austrian-born immigrant who became one of Brisbane's foremost architects and it was built by the prominent Brisbane firm of CP Hornick & Son Pty Ltd - a firm that also constructed the Brisbane Taxation Office, the Centenary Pool and the JD Story Building at the University of Queensland. Here is their photograph of the completed Main Roads Building. Karl Langer was born in Vienna in 1903 and his early training occurred there. He was admitted to the Vienna School of Fine Arts in 1923 and graduated in 1928. After years of further part-time study he became a civil architect in 1931 and a Doctor of Art History in 1933. He began a small practice in 1934 and his work was well received; however, the Great Depression and the rise of Nazism were detrimental to further success. Langer had married in 1932 to Gertrude, a fellow art student who was Jewish. They foresaw the terrible times ahead and slipped out of Austria, escaping to Australia via Greece. They landed in Sydney in 1939. Finding work scarce in Sydney, Karl and Gertrude moved to Brisbane where they settled. Their European sophistication and their knowledge of architecture and art soon had them placed at the centre of Brisbane's nascent art scene. In fact Gertrude became the art critic for the Courier-Mail and Karl lectured in architecture st the University of Queensland. 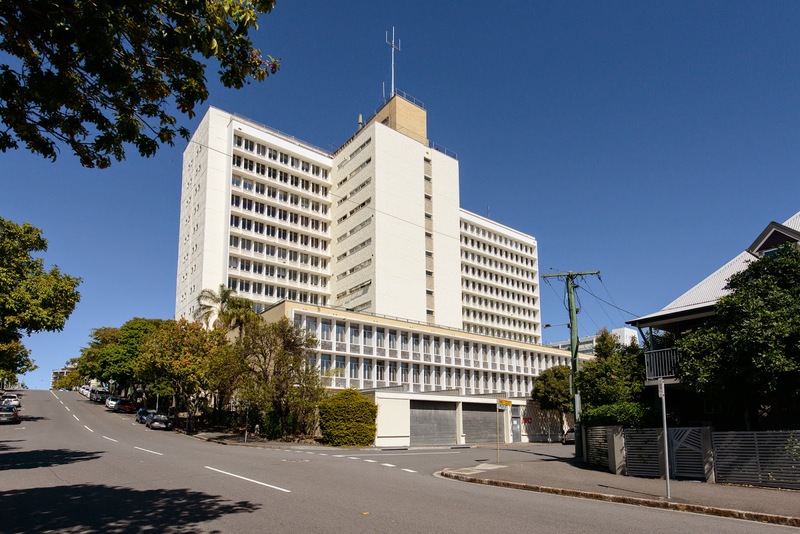 The true scope of Langer's work and his cultural influence is greater than space here allows, but suffice to say that he designed some of the state's most important buildings - Lennon's Hotel Broadbeach on the first canal development on the Gold Coast; Lennon's Hotel Toowoomba; Kingaroy Town Hall and Civic Square; Ipswich Girls' Grammar School Assembly Hall; and many more. He was also involved in the selection of the site for the Sydney Opera House. After his death in 1969 both the University of Queensland and the Queensland University of Technology inaugurated prizes commemorating him and his work. 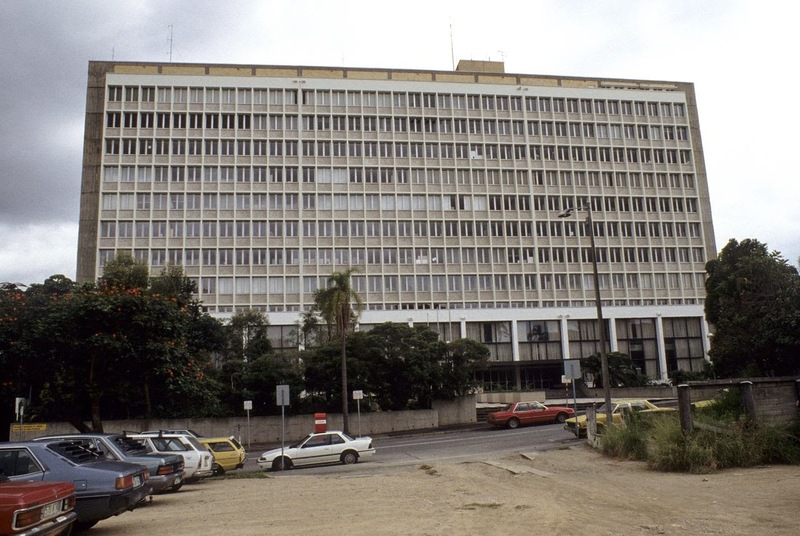 The construction of the Main Roads building allowed the department's work force to be aggregated at the one site rather than being scattered. More than 1250 employees from eight different offices were moved there after the building was completed. At the time it was considered to be a state-of-the-art workplace with modern appointments and the latest business equipment - even including a computer. What is its current fate? 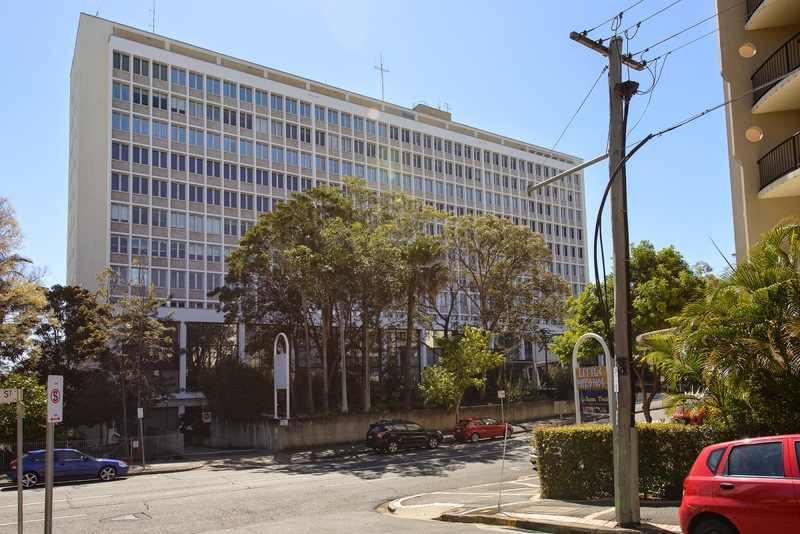 The restructured Department of Transport and Main Roads vacated the building in 2012 and it was sold in December 2013 for $22 million to a developer who plans to turn it into a luxury hotel/apartment complex, apparently to cost a further $155 million or so. Welcome back TFF, hope the corner is well & truly turned & easier roads lie ahead. Can't say Main Roads looks any more enticing than it did when I was kid. Nor has absence made the heart any fonder. I do miss some of Brisbane's modern buildings like the mural bit of the State Library and even the 1980s bits of the Culture Centre. Yes, can't say that the Main Roads building is beautiful or even stylish. Guess functional will have to do! I always enjoy reading your posts so have nominated you for the "One Lovely Blog Award". Please do not feel that you need to participate but I hope that you get more readers. And welcome back! !